你何必跑到官网去下载呢? Winrar 乱码了,用 7-Zip 解压就没问题, 我也是从官网下载之后再打包. MsgBox, 33, Kill Process, Title:`t[%KillTitle%]`nClass:`t[%KillClass%]`n`nKill the process? AddAppNoEdit1=Title:`t[%Title%]`nClass:`t[%Class%]`n`nEdit1 do NOT exist!`n`nDo you still want to add this application? 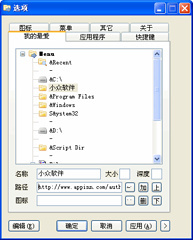 特别是第一个，是我使用 Listary 不用 Folder Menu 的唯一原因.